Have you ever tried doing a handstand? It’s not as easy as you may think and is in fact pretty challenging. Along with being challenging, there are of course many benefits of handstands that you may not know about. After all, something that is challenging means that there are usually benefits to be had from it as well because with a challenge comes training, and training makes you better at things. There are a whole lot of benefits that come along with doing handstands and you may be surprised to find out that they can do a lot more for you than just allowing you to join Cirque du Soleil! We don’t want to sound pretentious, but a handstand is exactly what it sounds like; standing on your hands. Of course, this involves inverting your whole body so you are standing on your hands instead of your legs. Technically speaking, doing a handstand actually qualifies as an isometric exercise. Isometric exercises involve static training, or in other words pushing against an object that doesn’t move or holding a certain position for a prolonged period of time. Isometric exercises have various benefits and that goes for handstands too. One of the biggest benefits that you can get from doing handstands on the daily is the building of your core strength. Of course, handstands train your arms and shoulders to be stronger, but that isn’t all. Being upside down and standing on your hands forces you to engage your core very much. It takes all of the strength that you can muster in your abdominal muscles as well as in your back to stay upright and balanced while doing a handstand. Since you need to stay stable while doing a handstand, because it does require a lot of balance, it forces you to use the various muscles in your core to achieve that balance. Being upside down like that requires you to keep making bodily adjustments to stay that way and many of those adjustments need to be done with your core. If you thought that handstands weren’t good for strengthening your core, you couldn’t be more wrong. You don’t have to do a bunch of sit-ups to get those abs you always wanted when you could do handstands and you can have fun while doing them too. Not only does a handstand force you to engage your core, but of course it also forces you to use your upper body to stay upright, especially your arms and shoulders. Just think about it, doing a handstand means that you are literally standing on your hands, thus you are supporting all of your weight with your upper body and your arms. Just a few minutes of standing on your hands will go a very long way in strengthening your hands, arms, shoulders, and virtually every other muscle in your upper body. Holding up your own body weight takes a whole lot of muscle strength and doing handstands on a regular basis will definitely help improve your upper body power. You may not be able to hold yourself up for very long in the beginning, but after a few weeks, you should notice some strength improvements no doubt. To increase the intensity of the exercise and to build even more muscle you can even try doing handstand pushups. Sure, they are challenging, but a few handstand pushups will definitely make your arms and shoulders a whole lot stronger. To be clear, your endocrine system in your body is a collection of glands that release hormones into your body. These hormones do things like regulating growth, development, metabolism, mood, sleep, sexual function, stress, reproduction, and tissue function too. This system consists of things such as the pituitary gland, adrenal glands, thyroid gland, and a few other things as well. Standing on your hands means that your heart is more elevated than your head, something which is very important when it comes to the endocrine system because it forces an increased amount of blood to flow to your head. One of the biggest benefits of this is that the increased blood flow stimulates the thyroid glands. These are the glands which help to regulate your metabolism and the increased amount of blood flowing to them causes the increased production of T3 and T4, 2 hormones which help to boost your metabolism, thus helping you burn more calories and keep the weight off. Another benefit of this increased blood flow to the head is that it stimulates your adrenal glands to produce less cortisol. Cortisol is a stress hormone and the decreased production of it helps to reduce the daily stress that you experience. This blood flow to the head also helps regulate your pituitary gland which helps set a healthy weight point for your body. In essence, handstands help your body’s glands to be more effective and efficient in the production of healthy hormones. The next thing that handstands can do for you is to increase your grip strength. When you stand on your feet your heels act as a stabilizer and they help you grip the ground plus stay upright too. Yet your hands don’t have heels, thus making it harder to balance. Therefore in order to achieve optimal balance when doing a handstand, you need to use your fingers in order to stay upright. When doing a handstand you need to use your fingers to dig into the ground, to stay balanced, and to keep your body from toppling over. A handstand forces you to constantly adjust your position and that requires your finger’s extensors and flexors to work overtime to keep you from falling over. This process of constantly using your fingers to adjust your position, as well as the whole digging into the ground aspect, trains your fingers and forearms to be stronger and ultimately increases your grip strength. Grip strength is important for various aspects of daily life, for sports, and for things like weight lifting too. Another thing about doing handstands is that they help reduce stress. As we mentioned before, the increased blood flow that your head experiences from doing a handstand causes a decrease in the production of cortisol, a hormone that causes stress. That isn’t the only reason that handstands can help reduce stress, though. Another well-known fact is that exercise is good for mental health in general, especially your happiness. Exercise, even something as simple as a handstand, causes your brain to release certain hormones. Some of those are called endorphins. Endorphins are a feel happy chemical that is naturally produced by your brain, and the more you exercise the more endorphins get produced. Increased amounts of endorphins in your brain will make you happier, reduce stress, and reduce the effects of anxiety and depression too. Therefore something as basic as a handstand can directly contribute to your happiness and your mental state of being. Another positive aspect of endorphin production is that they help to reduce your perception of pain, thus reducing the pain that you feel on a daily basis. A huge benefit that you can reap from doing handstands is that they increase the musculoskeletal health in your upper body. In simplest terms, your musculoskeletal health is the health of your bones. To increase the health of your bones you need to do weight bearing exercises, and of course doing handstands is considered a weight bearing exercise because you are holding up your entire weight with your arms. A weight bearing exercise helps to increase the health of your bones the same way that it strengthens your muscles. These types of exercises force your bones to create more bone matter and the more you do weight bearing exercises the more cells your bones will create. Therefore doing handstands will force the bones in your hands, arms, and the rest of your upper body to produce more bone mass. That means that the bones in your upper body will become denser and stronger too. Not only are stronger bones good for preventing breaks and fractures, but they also reduce the chances of getting conditions such as osteoporosis. Personally one of our favorite parts about handstands is that they give you a good workout while also taking away the need for exercise equipment. Equipment like weights, resistance bands, and other exercise tools can cost a whole lot of money, which of course is something which we would rather avoid. 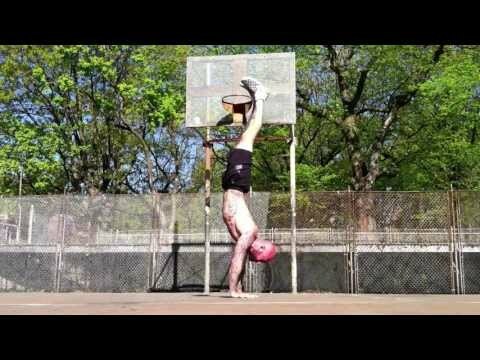 If money is a little tight for you, handstands are a cheap and equipment free alternative to other expensive exercises. Even better is the fact that you don’t need anything but yourself to do a handstand. Sure, you might want a Yoga mat or something soft so your hands don’t end up hurting, but that’s pretty much it. The only thing that you really need, at least if you are a beginner, is a wall to support yourself on until you get the hang of it. Another good aspect about handstands is that they don’t require you to have much space. You can literally do a handstand against your wall and it really doesn’t take much more room that a few square feet. You don’t need a gym membership either because you can do them in your own home, at the park, or anywhere else with a flat surface. Another big benefit that you can get from doing handstands is that they increase your ability to balance. This has to do with something in your body called proprioceptors. Proprioceptors are the things in our body which control the way we balance and how our muscles naturally react to a change in position in order to stay upright. Usually, when we think of proprioceptors we only think of them in terms of being upright or standing on our feet, but they are also important for staying upright while doing a handstand. Doing handstands and other ﻿﻿balance exercises will train your proprioceptors to be able to react more quickly to changes in your position, thus increasing your body’s natural ability to balance. Being upside down also helps to increase your spatial awareness. This is because usually when you are upside down, your brain will get disoriented. However, constantly doing handstands will reduce your brain’s tendency to get disoriented. Through this process, you are actually training yourself to be better able to deal with changes in position or orientation. This has to do in part with muscle memory, getting used to new positions, as well as the training of your proprioceptors. Something else that we think is really important to note when it comes to handstands is that they are actually very fun to do. Have you ever really challenged yourself physically? Handstands are definitely a challenge, but they are a fun challenge! It’s really exciting to do handstands because you can do with friends and even have competitions to see who can do the best handstand for the longest. Once you get really good at balancing, you and your friends can even have competitions to see who can walk on their hands for the furthest distance. The simple fact of the matter is that challenges are fun and standing on your hands is definitely quite the challenge. If you haven’t been an avid handstand enthusiast, you may want to become one. The benefits of handstands are almost endless and they will benefit you in various ways. Improving your balance, increased strength, and even better moods are just a few of the advantages that are to be had from doing handstands regularly. They may be hard to do at first, but with some practice, they become pretty easy, so don’t give up if you don’t get it down within the first couple tries. If you have any comments or questions about the art of the handstand, we would be more than happy to address them!